In recognition of Mental Health Awareness Month in May, these two trainings will be offered at a reduced fee of $25 per person. Check back often for additional classes! 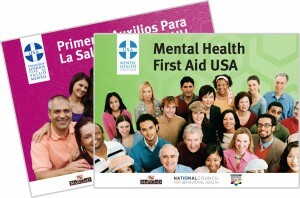 Mental Health First Aid and Youth Mental Health First Aid are 8 hour certification courses. If you are interested in taking either training, please let us know so that we can contact you as classes are being scheduled. We can also offer group trainings at your business or organization. Please contact joanne.weir@yourmha.org, or click on the link below, to discuss these options. How would you know?And how can you help? 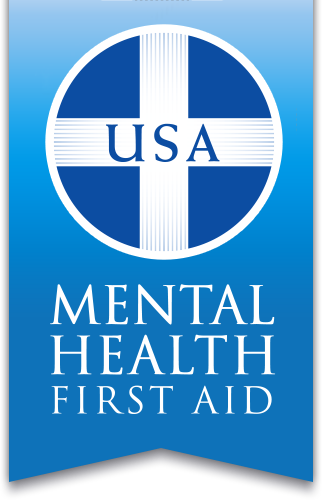 The adult Mental Health First Aid course is appropriate for anyone 16 years and older who wants to learn how to help a person who may be experiencing a mental health related crisis or problem. Topics covered include anxiety, depression, psychosis, and addictions. The adult course is available in both English and Spanish. Course participants come from a variety of backgrounds and play various roles in a community, and instructors may specialize in providing the course to groups such as police officers or faith leaders. 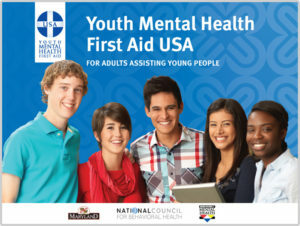 Youth Mental Health First Aid is designed to teach parents, family members, caregivers, teachers, school staff, peers, neighbors, health and human services workers, and other caring citizens how to help an adolescent (age 12-18) who is experiencing a mental health or addictions challenge or is in crisis. This class is intended for those who work and interact with adolescents, it is not appropriate for children to attend this training. Classes are scheduled on an on-going basis. Please check our website and Facebook often for updates, or contact us at 607.771.8888 regarding future classes, fee schedules, or to discuss our providing a training for your organization.